I found some planks that had been discarded on O’Farrell street (picture here), and decided to make a cutting board from them. I’ve only got about 2′ x 3′ of counter area in my comically tiny San Francisco apartment anyway, so I’m essentially replacing all of the counter space. 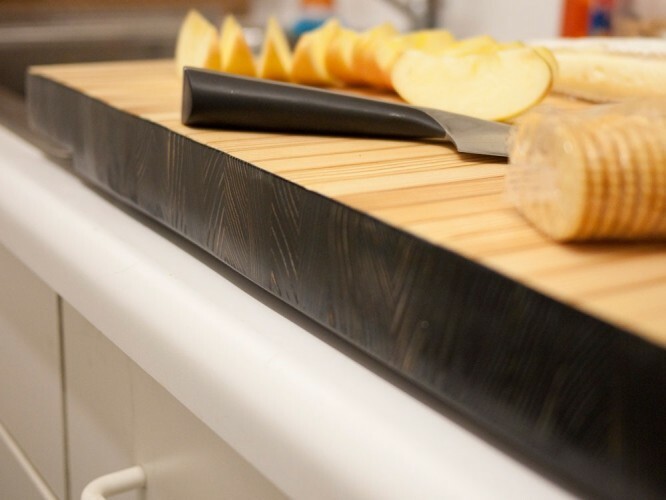 That suits me because I feel like cutting boards are kind of a sub-optimal solution, in that you’d ideally want the entire workspace to be a cutting area. But that ended up being impractical, first because you would have to stain the pieces before assembling, and after you assemble them there would have to be additional planing and sanding (as things turned out, a *lot* of planing and sanding). Also important: I couldn’t find a stain or dye that I was sure wouldn’t leach into the food. I could have achieved the effect by using two different types of wood, but the goal for this project was to use up the free wood I found. Detail of three of the planks being glued together (in my vise, which I also made :) ). 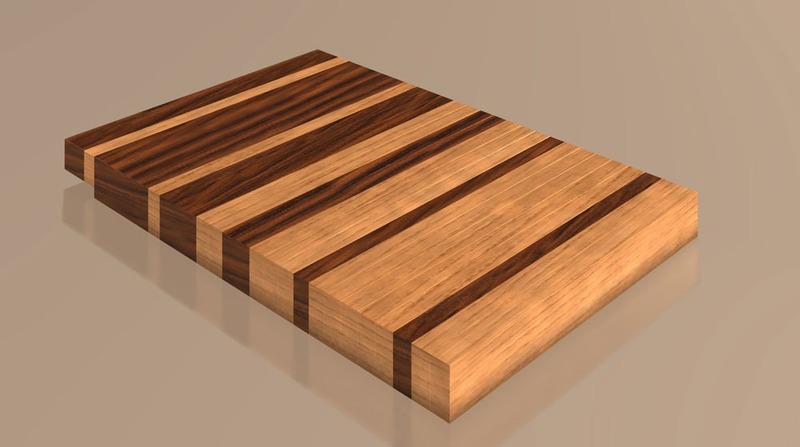 There are internal dowels that run the length of the board for strength and rigidity. 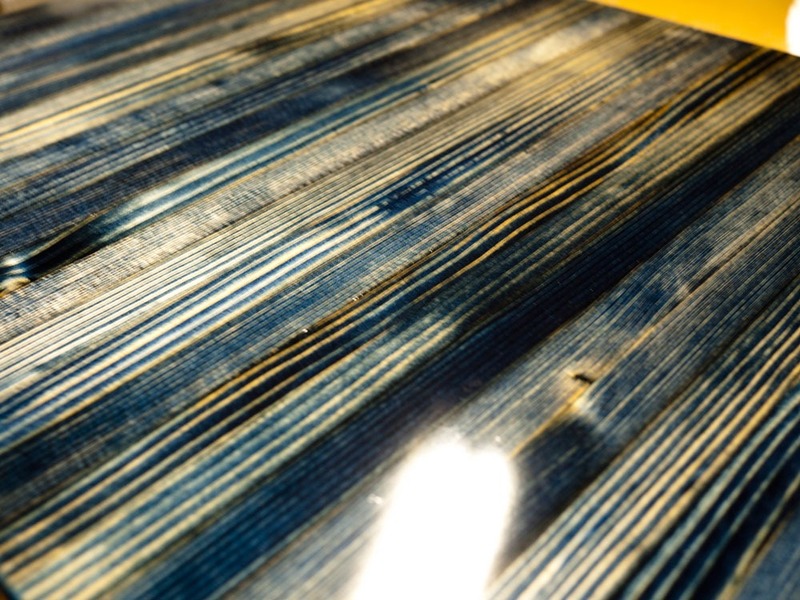 I still wanted that linear semi-random texture, so after some experimentation what I ended up doing was this: I left the top surface untreated except for mineral oil, and used a dye rather than a stain to lay the color all over the back. Then I went over it with a few layers of water to raise the grain as much as possible. 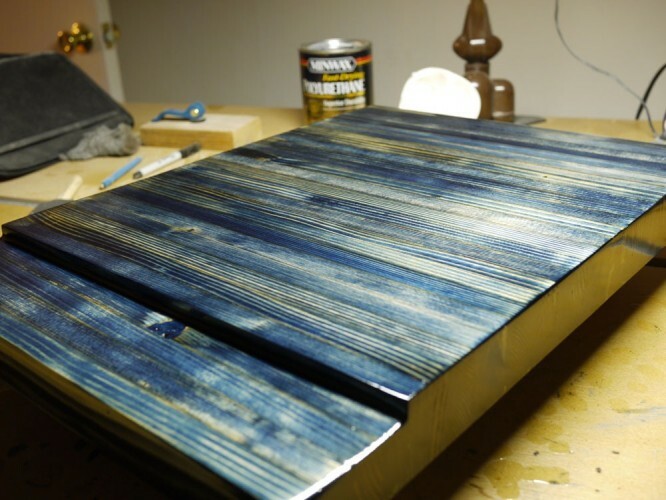 When I sanded it down flat again, the parts that were raised were completely removed, and so I got a really strong zebra effect from the natural wood color versus the stained dark blue/black parts that weren’t removed. The finish came out so well that it’s kind of a pity that it’s on the bottom and sides where it’s less visible. 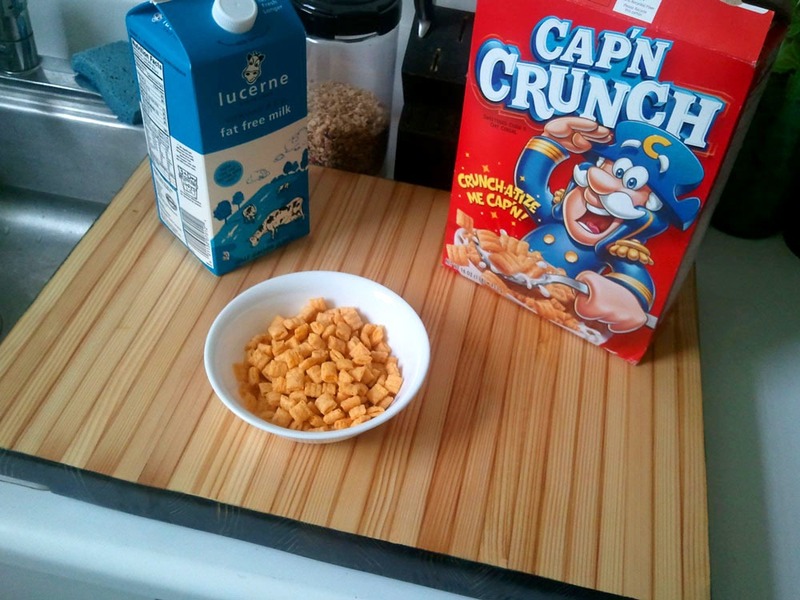 You can see on the end there’s a raised section, so that the end of the board actually overhangs the sink slightly. That’s great for cleanup because I just wipe everything into the sink– it’s too large and unwieldy to pick up and clean, otherwise. I’m really happy with the way it all turned out, and it’s such a pleasure to use something every day that you’ve made. I was a little worried about the durability of pine versus a hardwood for this application, but as long as I treat it with mineral oil it seems to hold up fine. If I was going to do it all again, I would definitely use a powered industrial planer—it took me a lot of time to get everything flush and true by hand. I’m a pretty terrible cook, actually.